Last year, I asked the Lord if I could go someplace with Him, with my camera, and He very clearly said, "Arlie Gardens". So I went 2hrs towards the coast and when I got there, it was like I was in heaven. His presence was on me all day. I wept and laughed, and enjoyed His Company. I took this photo of the arbor when I was there, the flowers/grapes were not part of the original photo, but I felt they had to be there. 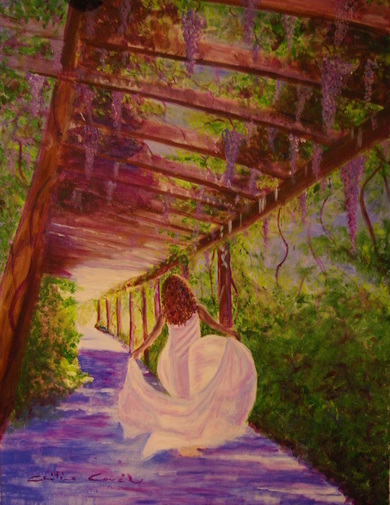 And the Bride is a photo I found online that represented how I felt that day when I was with Him. 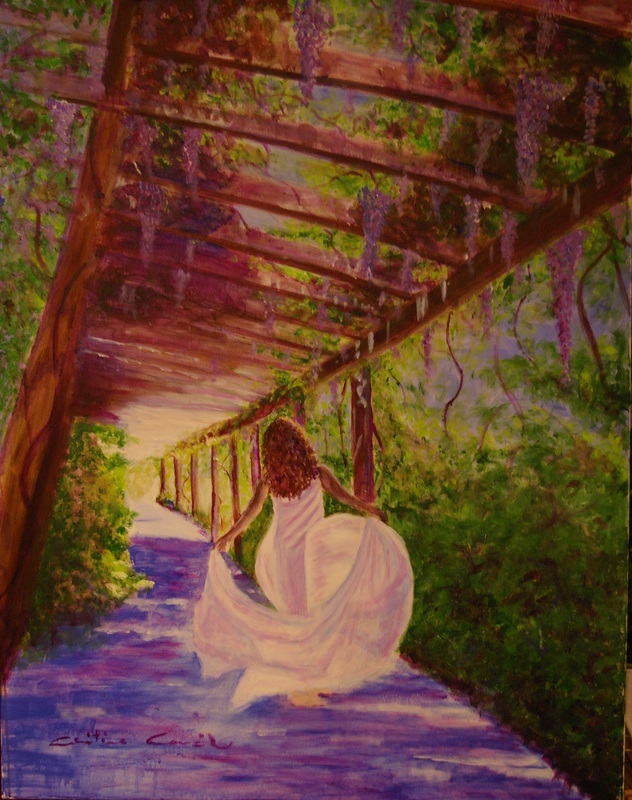 While I working on it, the last thing I completed was the covering, so it was still white for most of the time I painted....one of the speakers said he thought the covering over her was a Chuppah...I was like, what is that? So I looked it up. A chuppah (Hebrew: חוּפָּה, pl. חוּפּוֹת, chuppot, literally, "canopy" or "covering"), also huppah, chupah, or chuppa, is a canopy under which a Jewish couple stand during their wedding ceremony. A chuppah symbolizes the home that the couple will build together. It also is placed over the marriage bed on the wedding night. That night during worship, the Lord took me by the hand...and we ran away together...into a beautiful field. It was so precious, innocent and intimate. We ran together like children laughing and playing. At one point, we sat on the grass, and he brought out a picnic basket. Then He began to feed me. Eventually we laid down to look up at the sky, that is when He leaned over me...it was like He was covering me...and it was then that He told me how much He loved me. I did not want to leave, and I was not sure what He was showing me. So the last morning I was set to paint...I went to be with Him, and was thinking about the painting...about the scripture, "His banner over me is LOVE"...wondering where it was. I didn't know where to begin, so I opened Song of Solomon looking for title of the painting, AND there it was...SOS 2:4 "He brought me to the banqueting house, And his banner over me was love." Then it made sense, why He had taken me on a picnic. Isaiah 4:2-6 (New International Version, ©2011) 2 In that day the Branch of the LORD will be beautiful and glorious, and the fruit of the land will be the pride and glory of the survivors in Israel. 3 Those who are left in Zion, who remain in Jerusalem, will be called holy, all who are recorded among the living in Jerusalem. 4 The Lord will wash away the filth of the women of Zion; he will cleanse the bloodstains from Jerusalem by a spirit[a] of judgment and a spirit[b] of fire. 5 Then the LORD will create over all of Mount Zion and over those who assemble there a cloud of smoke by day and a glow of flaming fire by night; over everything the glory[c] will be a canopy. 6 It will be a shelter and shade from the heat of the day, and a refuge and hiding place from the storm and rain. "Daughter of Zion, Tell them I love them, and I long to be with them. Come and be with Me. I have set a banqueting table before you and I desire to dine with you. Fear not, for my glory is a covering for you. Fear not for my Love has covered you. It has made you whole. Soon we will be together at the Great Wedding ceremony." I pray you will want to run away and go to be with Him when you see this painting.